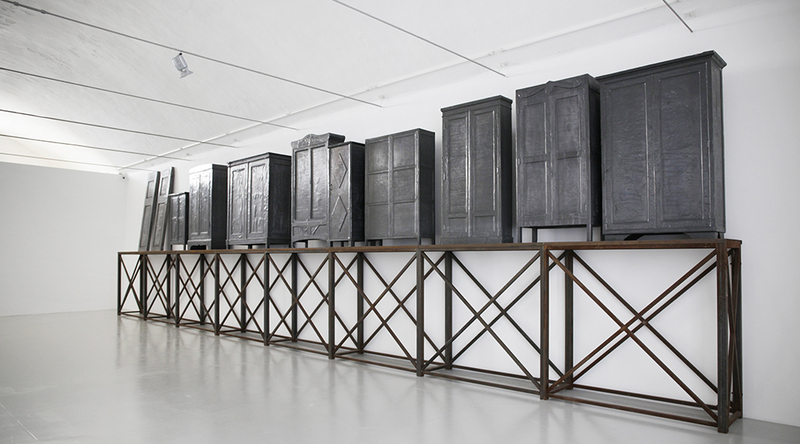 From April 28 until October 10, 2015 the Raussmüller Collection is showing major works by Jannis Kounellis in Milan. The exhibition, which is being held in conjunction with Spazio Christian Stein, brings together a selection of key works in a presentation that underscores Kounellis’ importance as a pioneer of a new art conception. A number of the works on display are famous the world over, while others are seen here in public for the first time and others again for the first time in Italy. The physical presence of these works is an impressive experience. What makes Kounellis a leading representative of New Art are the material properties of his works and the immediacy of their physical and emotional impact. Kounellis himself calls his works “pictures”. But the “pictures” that he makes differ fundamentally from conventional art. Instead of illustrating life, they incorporate it as such: fragments of the real world – animals, plants, coal, human hair – are brought into “scenic” constellations in such a way that a new reality arises, stimulating the imagination of the viewers. In his works, Kounellis deploys means that speak to all the senses and with poetic fantasy produces an extraordinarily direct effect. It comes to its full force in the rooms of Spazio Christian Stein. The Kounellis presentation is taking place during the 2015 universal exposition in Milan. Spazio Christian Stein is situated in the immediate vicinity of the Expo site on the outskirts of the city. Since 2014 Spazio Christian Stein has implemented a new concept of museum-level exhibitions, created in cooperation with well-known foundations and collections and focusing on works by artists who have profoundly shaped the notion and appearance of art since the 1960s. The Kounellis presentation follows the internationally acclaimed exhibition “Alighiero e Boetti”, organized in conjunction with the Fondazione Boetti. Read an Article about the exhibition in Rivista Segno (Italian).